On a recent vacation, my husband and I stayed at a house beside the Wenatchee River in Eastern Washington. There were two families of geese, one with three goslings, one with four. The cute babies were very young, their feathers still fluffy yellow. We watched them in our small yard for nine days. 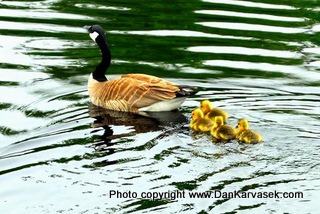 It quickly became obvious how completely trusting and dependent on their parents the goslings were. The parents did all the planning and leading. The goslings were only concerned with eating, sleeping and following their parents. The parents took them to good feeding ground and watched for danger while they ate. If they sensed any threat, they would scare it off, or move their babies to the water. While in the water, one parent would lead and the other would follow closely behind the family, keeping watch over them. All the goslings did was follow the one in front. When it was time to rest, the pair led their babies to a safe place and one of them would spread its wings, so the goslings could rest underneath in comfort and safety. I noticed the goslings never argued or tried to go their own way. They were perfectly happy to go and do exactly as they were led, never worrying about what was ahead. They didn’t get distracted with what was going on in other parts of the yard. They were the perfect picture of submission and trust. It’s all they knew; it’s all they wanted or needed. We are God’s children. He takes care of us in the exact same ways. But we have to fully submit and trust in order to receive the full benefit of what He wants to provide. It’s the way He designed His creatures to live. This entry was posted on January 22, 2012 by Administrator. It was filed under Following God, Nature, Submission, Trust and was tagged with Geese, Psalm 91.